Have the Best “Heart to Heart” on Valentine’s Day at the Houstonian Hotel, Club and Spa! 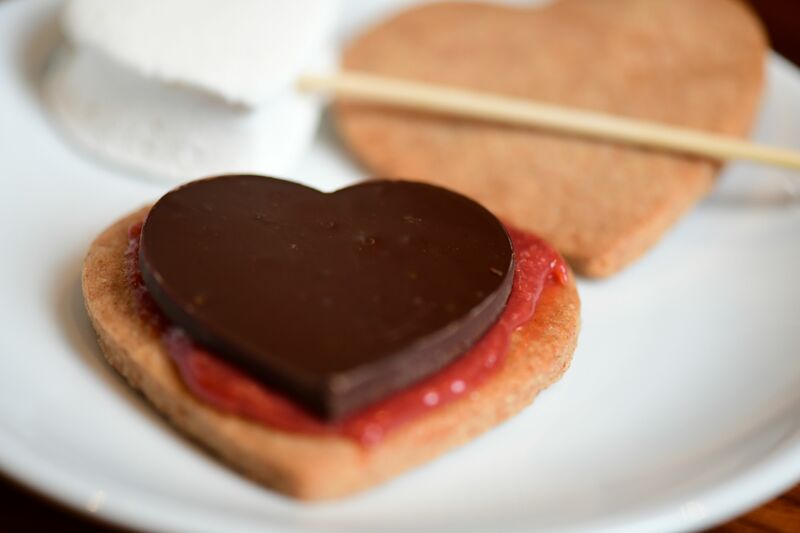 The Heart to Heart package at the Houstonian Hotel, Club & Spa allows guests to build their own s'mores in whimsical Valentine's Day shapes. Photo courtesy of the Houstonian Hotel, Club & Spa. The Houstonian Hotel, Club & Spa is showering sweethearts with romance and roses this Valentine’s Day with its Heart to Heart package. The all-inclusive deal combines the luxurious features for which The Houstonian is known: fine dining, cozy accommodations and exquisite service. Upon arrival, guests receive complimentary valet parking and can then check into their deluxe room, where a dozen roses and a bottle of Prosecco will be waiting. They’ll also receive $100 in dining credit at TRIBUTE, the Houstonian’s new, signature restaurant. Executive Chef Neal Cox drew inspiration from Texas, Louisiana and Mexico in crafting TRIBUTE’s menu, which blends fine dining with familiar flavors. Guests can select from the a la carte menu options, beginning with choices such as wood-fired Gulf oysters in chorizo sauce or bacon-wrapped Bandera quail before settling on main courses such as Smoked Wagyu Short Rib accompanied by creamed corn and pickled vegetables or Snapper Rockefeller with creamed greens and oyster croutons. The Heart to Heart package comes with a special dessert, S’mores for Two, an interactive experience where couples create their own sweet ending with ingredients like housemade, heart-shaped graham crackers and marshmallows, Valrhona passionfruit ganache, strawberry ganache, hazelnut praline, and milk and dark chocolate hearts. TRIBUTE’s elegant dining room, from its wood wall of wine lockers to its windows overlooking The Houstonian’s lush grounds, evokes a feeling of exclusive luxury. Deluxe accommodations come with a dozen roses and a bottle of Prosecco as part of the Houstonian’s Heart to Heart Valentine’s Day package. Photo courtesy of the Houstonian Hotel, Club & Spa. Heart to Heart package guests are also going to have ample opportunity to explore the hotel’s grounds, as the package comes with a 2:00 p.m. late check out. They also receive complimentary access to The Houstonian Club, an exclusive 125,000 square-foot fitness center complete with indoor and outdoor tennis courts and garden and resort-style pools. Group exercise classes are also available, with sessions in yoga, spinning and cycling. Heart to Heart packages can be used for check-in on February 8, 9, 10, 14, 15 or 16. Prices range from $389 for a deluxe king room to $1,074 for an executive two-bedroom suite, all based on availability on time of booking. Any cancellations must be made 72 hours in advance, or a $125 fee will be charged. All Heart to Heart packages may be booked online or call 713.685.6810 to reserve or for more information. The Houstonian has long been an oasis in the midst of high-energy Houston. This romantic Valentine’s Day getaway is the chance you’ve been waiting for to unwind and be pampered.